It’s Monday morning, so time to get caught up on my emails for the day. 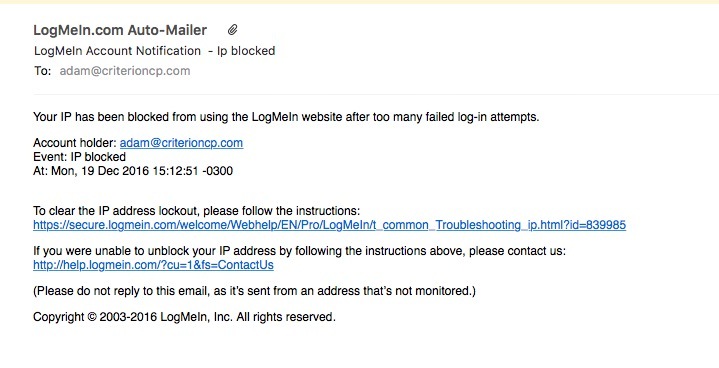 Ah, here’s one from a company that I’ve used before: LogMeIn. They have a neat service to allow remote control of computers, quite the time saver so that I don’t have to hop into my car and drive over to a client location and see what is going on with their computer while browsing a web site that I’ve built. The actual email looked a bit suspicious to me at first. What caught my eye first was that there was no corporate logo in the email, or a footer with the typical security language. Secondly, there was no personal information like my complete first and last name or my account number.